If you know anything about cars or car history, you will certainly know everything about the famous MG car that used to pack the streets all across the UK. Buy a single copy or subscription to MG Enthusiast magazine. Whether you own an MG yourself or you just have a great affinity to this beautifully unique car, then MG Enthusiast is your one-stop-shop for everything regarding this spectacular piece of UK history. This magazine prides itself on bringing you a MG specific magazine that covers every MG that was ever built, from the first 14/40s to more modern models like the MGB or the Midget. If you are looking for a magazine that breathes new life into this classic model that had once taken the world by storm, and in some ways still does, MG Enthusiast is the perfect magazine. Each magazine is packed with exclusive and deeply informational information regarding each model, and while the wealth of articles will undoubtedly keep you fully captivated, you will also be delighted by all the MG photography that is beautiful and stunning in nature, just like the MG. Everything that you love about the MG can be found in every issue, and therefore if there is anything that you have ever wanted to know about specific models MG Enthusiast will definitely provide. 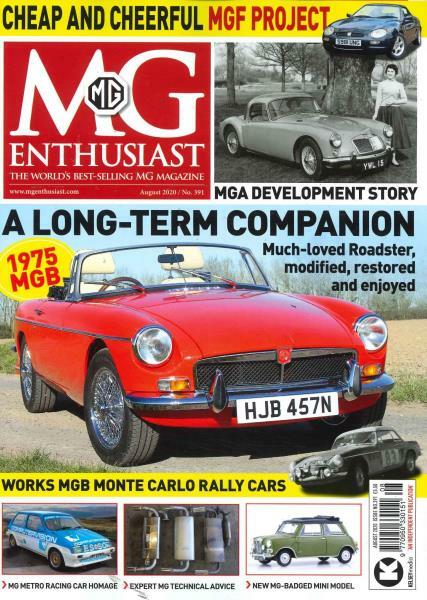 Additionally, MG Enthusiast is a great magazine at showcasing all of the wonderful things that MG owners have done with their cars, from classic refurbishing to modern styling an adaptation. You find entertaining and fun real-life stories and MG specific articles that pull you into the MG world and define what it means to be a MG owner. MG Enthusiast also provides you with expertly written reviews, the latest gear, buyer guides, and easy-to-follow tips and techniques that you can use to protect your own MG and make the best out of your MG experience. Excellent magazine - I will be subscribing. Quality magazine with helpful contcts for my project.